An often-remarked-upon phenomenon in the transit world is the preference, perceived or otherwise, for rail over buses. But this tendency has not been well understood. A pair of recent European case studies delved into this issue, and their findings help illuminate the psychology behind what many have observed. In the first study, set in Germany, 63 percent of subjects preferred a regional train system over an equivalent bus system, given a hypothetical choice with all other factors being equal. Meanwhile, in a second study set in Switzerland, 75 percent preferred trams to buses — even given identical service levels. Of note, researchers found preferences for rail travel were “rather irrational” and “highly loaded with emotional and social attributions.” The largest factor explaining the favoritism was “emotional attributes,” like nostalgia, accounting for 38 percent of the bias in Germans. Meanwhile, concrete factors like differences in seat structure or the merits of a fixed guideway accounted for only five percent each. Even very high-quality bus systems were not immune from the emotional effect, the report noted, but the researchers pointed out that negative perceptions faded as familiarity with better bus systems increased. According to the report, almost all daily transit users preferred train travel. Younger people showed a particularly strong preference for rail. And the preference for train travel increased with education, but not income. Researchers cautioned that because modal preferences are so profoundly influenced by cultural and emotional factors, the findings may not be generalizable to other cites or countries. 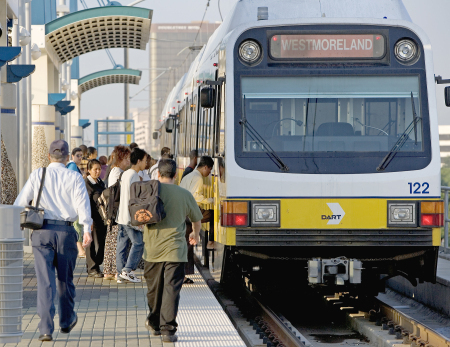 Jarrett Walker, a transit consultant and author of the blog Human Transit, told Streetsblog that decision-makers should not interpret the results to mean rail is necessarily preferable in every case from a public investment standpoint. Because of rail’s higher cost and limited flexibility, there are always tradeoffs, he said. “Yes, people like rail, but do they like a small rail network more than like a large bus network?” he said. Walker said he advises his clients to make the bus experience as much like the rail experience as possible, in terms of connectivity, signage and even interior upholstery. The more comfortable and useful a bus system becomes, the more the preference for rail disappears, he said. Walker pointed out that the German study found that there are a percentage of people who reported they would prefer buses to trains. Their most cited reason? Routing — i.e. the ability to get where they need to go. Thanks to Reconnecting America for bringing this study to our attention. “All other things being equal”. But they arent. In the real world, capital is limited and if you can get a more expansive network of buses or just a few train lines, it may make sense to go with buses. In my experience, buses get stuck in traffic and have to wait at stoplights along with cars and trucks. But I live in San Francisco, which has some of the slowest transit times in the U.S. When we hear “bus,” I think most of us still think of a bus operating on the road with the same rules as other motor vehicles. Getting more people familiar with the possibilities for increasing the effectiveness of buses as transit — like dedicated lanes and signal preference — could help swing support from rail to buses and enable us to get more bang for our transit project bucks. I far prefer trains due to various issues that are mostly related to how they move. I can read on a train — I get carsick on a bus. A bus, especially a local bus moving in traffic, is much more likely to have to hit the gas or the break on short notice, meaning that people who are standing get knocked around much more violently and uncomfortably. Plus paying fares at the door on local buses takes forever. This is a little unfair, because I’m comparing heavy rail systems with local buses. I’ve never used BRT or had much of an occasion to use trolleys on a regular basis. I would be interested to hear if my perception isn’t universal, or if BRT (separated lanes, pre-board fares) solves these types of problems. Buses tend to be uglier. Their brakes squeal cacaphonically. The guideways for B.R.T. are usually not as visually-attractive. The quality of the ride is different. And, the mode is just too similar to a private automobile that the mass-transit vehicle invariably invites direct comparisons. Rail further has the romance of automated steering. Trains and streetcars follow a program and repeat it time and time again without human control. Autonomous buses along fixed-guideways, though, may be able to make B.R.T. somewhat similar in that respect. Make the stations as enjoyable as possible. Make the vehicles as aesthetically-pleasurable as possible. And, invest some creativity into the system so that these people movers become place makers. I remember reading a study somewhere about how businesses are much more likely to open up around rail, since it is permanent. Bus lines were seen as too easy to cut. I feel similarly about why I prefer rail, among other reasons. Mainly I see buses as what you get when the automobile and oil industries buy up the private streetcar systems and tear up the rails (see the great documentary “Taken for a Ride”). Buses are like cars but crappier; good public transit should bypass all the gridlock and reward you for riding, not punish you for not driving alone, and buses rarely do that. As @shamelessly:disqus wrote, that is the sorry state of surface transit in San Francisco, including streetcars, which just waste away the hours in gridlock and at red lights, while countless single-occupancy cars cross in front. Even slow streetcars on less than well maintained track are easier to read on than ANY bus I have ever ridden. As to “irrational/emotional” the unit cost savings of ONE driver for several hundred riders or more on a train v half as many on a bus is not debatable. In urban transit, point sources of pollution (diesel exhaust) are harder to police than central electricity production (which may well include hydro/solar/wind as well as fossil based generation). Rail is also more efficient than rubber tire both because of rail/wheel dynamics and the potential savings via regenerative braking. Ability to walk around easily during transit. Buses are a poor substitute for rail as the backbone of a public transit system, and people can sense that. People resent being sold second-rate infrastructure. We should attempt to go with rail the way pretty much every first-world country has. In the Swiss study (which compared buses to trams in an urban context) the stated reasons for the tram preference were clearly objective and not psychological at all: reliability, ride comfort, seating space and environmental issues (no exhaust) were the most important factors. All things are not equal. In the United States, the main difference is that rail projects are built to serve the wealthy, who use them to go to and from work, while buses serve the poor, who use them to go everywhere. Rail is associated with well dressed businessmen reading the WSJ, while buses are associated with squalor. This is 100% the core issue for me. Trains do not rock left and right much unless the rails are in very, very bad condition. Likewise they do not hit potholes, or gutters, or bumps in the road, etc. Even street-running trams that have to stop suddenly still only rock on a single axis rather than 3. Even worse, with diesel buses, you have to breath the fumes. Ew.Rail gives a quality ride that *exceeds* that of my car, because my car has to rock around and hit potholes just like the bus. And, when you are the driver, motion sickness is not as bad since you have more knowledge of when the motion is going to happen.This is why buses do not compete well with cars, but trains can easily compete on the quality of the ride. They don’t mention that rail gives you a smoother, quieter ride. I don’t mind a 1 hour commute on rail, because I can read and feel comfortable. If I did that commute by bus, I would not be able to read, and I would be shaken up by the constant vibration by the time the hour was over. Maybe buses powered by fuel cells can give you a quieter, smoother ride. Buses are usually subject to the whims of traffic (unless BRT, which is rare) whereas trains, especially subways, are not. Further, motion sickness is a huge problem on buses, and this is because lack of a fixed path (a rail) allows side-to-side motion. And finally, trains (again, especially subways), by having designated tracks separate from surface traffic, can be made more comfortable because they aren’t subject to all the requirements needed for driving on a road and interacting with other traffic, pedestrians, bicyclists, etc. In the end, nothing beats an extensive subway (like NYC, London, Paris, etc). Regarding rail transport being for the affluent, I was riding the LA Metro rail system yesterday, and we “pale people” were in the minority. Even the Metrolink diesel-powered suburban service has a diverse assortment of riders, not just the pale and prosperous. Buses get stuck in traffic. Additionally, buses wear out after about 12 years. San Diego has Light Rail cars that are 32 years old and are now being sold to Argentina, where they will run for many more. New York, London and Montreal have rail cars that are around or nearing 50 years of service. And buses require one operator per 40 to 60 foot bus in North America. While that same one operator can command a 10-car train in any city with long enough platforms. @505f121bb442370acd1bb532bec410ea:disqus Eastern Germany by 1998/2000 had an all new bus fleet as these were the first things to be replaced. While the rail network was improved, with rehabilitated stations, etc., the rail fleet was not entirely replaced. Refurbished, yes, but for example you can still ride on pre-1990 built Tatra trams in Berlin today. I thought the answer to this was clear long ago: the ‘dumb transit’ aspect. E.g. when you get on a train, you know where it’s going and where it’s not going because it’s on its own line. For rail based rapid transit, you know roughly how often it will appear at a certain stop at certain points in the day. Buses are (a) rarely scheduled so simply, especially on BRT lines where planners are dumb enough to try to shove multiple buses through the corridor, and (b) buses are more prone to schedule uncertainties and interruptions due to the ‘virtues’ of flexible scheduling, flexible routes and onstreet travel. Also, standing on a train isn’t nearly as crappy as standing on a bus winding through traffic. I heard Enrique Penalosa talk recently and he had a comment that while obvious, is key… essentially that infrastructure investments have bias, build a deluxe megahighway and it glorifies the car and motorist while belittling peds and bikes under the highway. Meanwhile building a deluxe greenway for bikes and peds elevates them while keeping the adjacent streets for cars as dirt. Of course Penalosa favors buses over rail, but its all about what the infrastructure investments communicate. Too often buses have no infrastructure, must share lanes with general auto traffic and a bus containing 80 people is considered the same value one car containing one person because road travel is about the number of vehicles moved not people. Buses come across as inferior, a transit vehicle built for an auto environment designed to use roads made for auto traffic where cars are the superior ones. No wonder buses are seen as for the poor without cars. Start to build bus infrastructure (or rail which by default requires infrastructure and typically its own RoW) and it changes the picture. Depends on what the transit is being used for. Intercity commuting will almost always be more effective by rail (if it’s constructed properly) , intracity communting is always better by bus, frequent stops, ability to re-route etc. In the end its economics that will dictate how people will get around, and the cheapest way to install a transit system is to use buses which use existing roads. Furthermore, as the USA slides backwards toward third world status, bicycles, motorcycles, and other efficient modes of transport will begin replacing what we see today. In the third world you don’t see people making any distinctions between one or the other. The problem is that the “all other things equal” cannot be located. When a bus line is started it is usually on the cheap. Throw some buses already in the fleet, post a few signs, make up a few schedules, make some kind of announcement. Ta da. Cheap transit, yes, but it looks like it’s thrown together. When a rail line is started, the railroad is brand new – even if the railroad already is there (one of the chief arguments for re-using existing railroads is often false – the existing rail infrastructure is usually in such deplorable condition that it is rebuilt from the roadbed up – virtually nothing from the old railroad is reused other than the land itself), the cars are new (albeit agencies may use a variety of vehicles, there is almost always a corresponding order for new vehicles), the stops are heavily invested in and brand new, often featuring “amenities” like art, lighting, oversized shelters, landscaping, oversized parking lots, schedules, real-time trip information… Sidewalks are often improved and crosswalks and pedestrian signals added nearby. In short rail always gets significant complementary upgrades which are rarely offered to bus riders and on new routes. Transit is more than just the vehicle itself, it’s the entire journey. Just as airline passengers prefer non-stop journeys or may choose certain airports to connect between flights; or may prefer one airport over another in larger areas (Los Angeles, San Francisco, New York, Chicago, London all have multiple airports). Rail is not the end-all, be-all solution. The mode of transport shouldn’t be decided on “is it a train” but rather which mode of transport offers the best service for the ridership demands. Rail is great when you have the quantity of ridership that needs it. But running empty or near empty trains, or running trains to places people don’t necessarily want to go is a waste of time and money. Buses offer significant benefits and are often adaptable to providing good transit in many places that make no sense for rail transport. I know of one such rail line that uses trains capable of 300 riders, but struggles (after ten years and extensive investment and advertising and all stations were either built new or extensively remodeled to the tune of several million dollars for each station) to get 80 riders on the train. The train ends up wasting fuel just pulling around it’s own dead weight, and two buses would easily handle the existing (remember, after ten years of service) ridership base while shedding three employees, would use far less fuel than the train…and could much more easily expand service to provide more convenient departure times whereas the railroad option is restricted in that regard. In my metropolitan area (SF Bay Area), while trains and subways take you from city to city, buses take you all around town. And just try to find long term parking at a rail station after 7 am. Folks need the bus. By the time you add on time parking, climbing to the platform, and waiting for your train, the bus can sometimes be close to the same time and more like door-to-door. Something else about the bus, even though I ride daily through some questionable parts of town on my way to and from work, the bus is a mini community every time I board. Everyone seems to be a little aware of everyone and that keeps most riders in check. On a subway or railcar, it is much more anonymous (the Operator is not usually present) and in my experience so far, my most uncomfortable moments in public transportation have been on railcars, not the bus. I would also like to add that the bus is a great way to get to know your community whether you want to talk or not — just observe and you will learn that there are not so many differences, and if there are, bus riders can be very tolerant and accepting as a class. So I recommend riding the bus over rail (if your trip is ten to fifteen miles or less) where it works for you. We all can benefit from mixing up our reference points. Because of this, I find the move toward private or exclusive shuttles and the assumption of railcars as being more exclusive and better a little troubling. Most buses can get stuck in traffic. Streetcars can get stuck in traffic. Streetcars are worse in traffic, because they can’t get out of their lane and manuever around traffic the way buses can. Yet streetcars are groovy and trendy, and politicians in city after city want to put them, often on top of quality bus networks. Most of the points that people complain about come from the failure/unwillingness to “make things equal” between rail and buses. There’s no reason, for example, that buses can’t have clear, easily read timetables, and in some cities they do. The rail network is generally thought of as simpler than the bus network–because it’s usually smaller. But the New York subway map is plenty complicated. Only a few points–like ride quality generated by the deteriorating quality of American roads–are really inherent to the mode. There are certainly issues and points of comparison across modes. But it has to be acknowledged that the imagery of rail is around middle-class people, and the imagery of buses is around poor, non-White people. Stigma is real, and works in the world. Jarrett Walker is technically right, but the fact is that with 75% preference rates, a lot of people would clearly prefer a small rail network over a large bus network. Even in the cities with the *absolutely best buses in the world* like London, people prefer trains. I think ride quality is the unchangeable factor which makes trains better, and that accounts for far more than 5% of the people; I bet the German study didn’t even consider it. Ride comfort *cannot* be fixed in buses; it is inherently poor (wobble wobble lurch) compared to trians. Seating space could be fixed on buses but only if you have a low-capacity route (and you shouldn’t consider mass transit on a low-capacity route). Environmental issues could be fixed with battery-electric buses or trolleybuses. But then you get into the fact that the buses just don’t last as long and you find that, with any significant volume of people, rail is cheaper. This is yet another example of spending a fortune to make rubber tires on asphalt do a job which is done better and cheaper by steel wheels on steel rails. There is *no reason* for BRT unless you happen to want to sell rubber tires, concrete, or asphalt. Everywhere where “BRT” is proposed, rail is cheaper in the long run. This is not to say that rail is suitable everywhere; it is not suitable for low-volume routes. But buses are barely suitable for those routes either. There is only a small niche for buses, and it is mostly for low-capacity buses. This is blatantly untrue. While continual operating costs of light rail and BRT are neck-and-neck, initial infrastructural costs of BRT are anywhere from 1/3rd to half that of light rail. On rail, I can buy the ticket beforehand and usually get change. On a bus, I will often be sent packing if I have enough money, but in the wrong form (paper money, not exact change) and it matters.